Every girl needs a statement coat. A coat that has a special detail, color or pattern. Personally, a statement coat is a Winter closet- must have. When you live in Chicago, bundling up tends to become a priority and style suffers. However, this doesn’t have to be the case. A statement coat instantly glams up an outfit without trying too much. Even a sweater and jeans look ten times more stylish when paired with a statement coat. It might very well be a lazy girl’s fashion trick. However in this look, I am taking things up a notch by adding some cute elements to make the look a little more edgy. 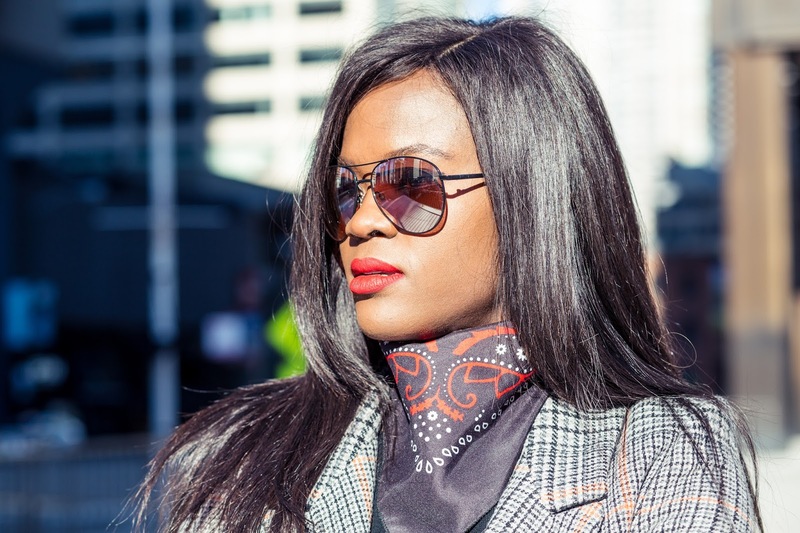 Try a scarf or bandana tied around your neck for some chic Parisian vibes. OTK boots look great with everything, so it is no wonder that I paired this mini skirt with my favorite pair. I must say this pair of boots is possibly one of my fave Winter uniform. The pattern on my coat actually consists of tiny houndstooths in a vertical and horizontal grid pattern which is very interesting to look at. Next time you want to dress up a look, pull out a statement coat. However, try to minimize the color palette of everything else underneath to two shades to avoid a clash of colors. Let the statement coat do the talking.